I had been thinking about that, and I was wondering, too, just what we would do. It is no secret at this house that the Wife of Certain Man has almost no artistic ability whatsoever. However, several of our children have pronounced talent and enjoy creating things with canvas and paint. They got that from their father, and even though he hasn’t developed his capacity, he often has ideas and a sense of design that far surpass my feeble attempts. That caused me to rather ruefully think of the year that Deborah was in Bangladesh or some other faraway place, and I had just scrawled, “We Give Thanks” across the top and that was the extent of it. People still signed it, but it lacked something. I decided to see if Certain Man might consider doing the job. With Grateful Hearts, oh God, to Thee, we’ll own the favoring gale. They have been so forcefully branded on my heart and brain. Almost every Yoder relative that we’ve buried in the last ten years has had that sung at their funeral. It started with my Grandpa Dave fifty-eight years ago, and when it has been possible and asked for by the family, those of the cousins (and sometimes uncles) who can, usually seem honored to help sing in the cousins choir. I think there were somewhere close to 30 family members who sang on Sunday at the memorial service. I did not. I could not. I cannot even sing that song in church without crying, and I knew I would be in no position to sing in front of a crowd of almost 400. I opted to stay in my seat. It was good I did. My husband’s strong arm held me close, his tears mingling with mine as I sobbed in the seat beside him while my cousins sang. And now, he chose a phrase from that song for the Thankful Wall this year. 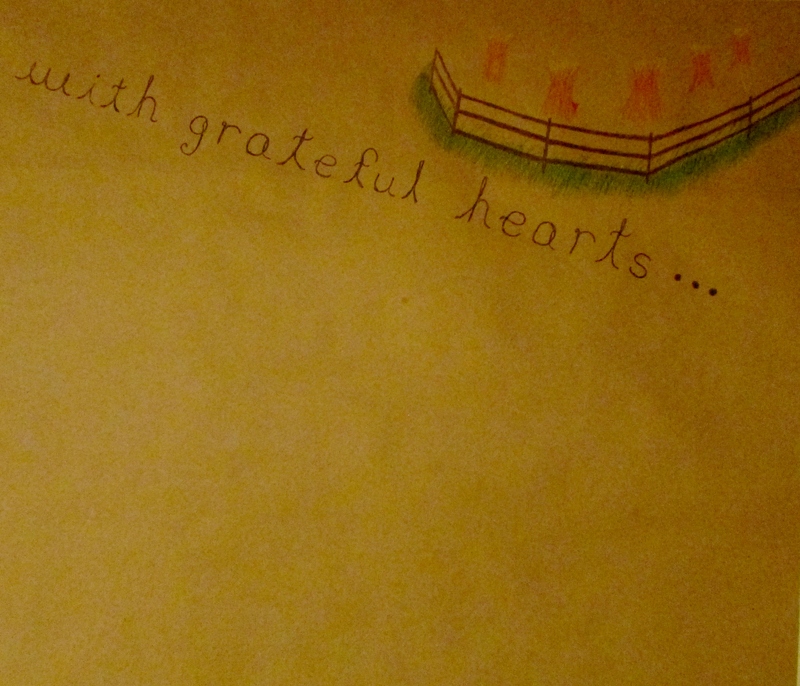 “With Grateful Hearts . . .” It settled into my heart and felt so appropriate. That is what I need to do in this present storm. Own the gale with a grateful heart and believe that it will be a “favoring” one. The truth is, I DO believe that this storm will somehow accomplish purposes that wouldn’t have been brought to fruition otherwise, and I do believe that somewhere, Frieda knows and is pleased. More importantly, our Heaven Father knows. He has a plan. May He be pleased. Certain Man let the paper lie on the kitchen table overnight while he mulled about the picture that he hoped to put up in the corner. Tonight he grabbed the pencils and finished it up, checked to make sure it fit properly and securely fastened it into place. It is done. Ready for the first signatures. So drop by and fill it up. The beauty of this wall is always the individual praises, written in many colors for such a diversity of people. My heart gives such grateful praise. What a wonderful idea, to have a Thankful wall. Truly God is so good, even when He chooses to take a dear one home….no more suffering.